The metric system is a measurement system that uses decimals and goes by tens. See the picture below for the stair step. Why are the metric system and the SI units so important and useful? Well, the majority of the world actually uses the metric system. So if you go to another country it wouldn't be miles and Fahrenheit instead it would be meters and Celsius. Once again it is measured in the powers of ten which is very convenient. What is the metric stair step and how can I remember it? 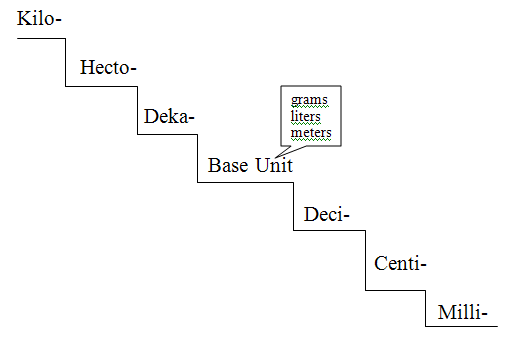 The metric stair step is a method to help with the units. Si stands for International System of Units. Why is it called Si then? Si comes from the French word Système International d'Unités which is the same as International System of Units. The base units are meter, liter, gram, and kelvin. Yes, there actually is abbreviations for length, volume, mass, temperature, and time. Length is meters which you can make 'M'. Volume would be liter which you can make L. Mass is gram which can be G. Temperature is Kelvin which can be K.
It was created during the French Revolution, June 22, 1799. In 1832, Gauss promoted the Metric system. He was the first to create the absolute measurements of the Earth's magnetic force of the decimal system. "Lesson I: The Metric System and SI Units." Lesson I: The Metric System and SI Units. N.p., n.d. Web. 15 Sept. 2014. "Units: The International System." Units: The International System. N.p., n.d. Web. 12 Sept. 2014.